Being an ISO 9001:2008 certified company, we emphasize on enhancing the quality standards of our quality generation biological fertilizers, micro-nutrient fertilizers, plant tonic, PGRs and bio-pesticides. Our qualified professionals ensure that our products are formulated with essential composition for the plant and soil. These are also tested stringently at every stage of formulations on different compositions and ingredients to ensure purity. 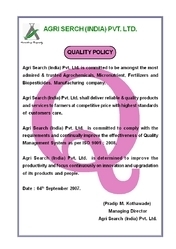 It is owing to our painstaking efforts that our range is certified by ISO. We also take care of the quality during the packaging and storing processes. Our ECO friendly range of generation biological fertilizer, micro nutrient fertilizer, plant fungicides, PGRs and bio pesticides has been able to satisfy our clients completely. We try to get the best of our capabilities to ensure that our clients are not faced with any kind of hindrance when it comes to the quality and reliability. To provide our clients with the best, we have employed latest technology and qualified team of professionals who work in tandem as per client’s requirements. They try to comprehend agricultural needs of our clients and then formulate products which can meet the challenging demands of GM crops. Working towards benefit of our farmers, we have been able to provide nutritional requirements of the crops by offering ECO friendly micro nutrient fertilizers and plant protection measures. We accept payments through bank, cash, internet and demand draft which ensure the transparency of our business dealings. Moreover, our timely deliveries of consignments and customized packaging facilities have enabled us to build and maintain cordial relations with our clients.